We love ballet because it can defy mortality. The grace and ease with which the pros do the most difficult steps refutes gravity and the way most of us clump along, meat bags with a few muscles and bones. On the other hand, many of the full-length ballets in ABT's current Met Opera House season underscore the frailties and downfalls of being all too human. Lar Lubovitch's Othello is revived every so often in part to showcase a powerful male dancer at the peak of his powers, and ABT has no better embodiment than Marcelo Gomes. Although the role was set on Desmond Richardson, it seems built for Gomes. As the curtain rises, simply sitting on his throne, clutching its arms, head bowed, he commands attention. The muscles on his bronze breastplate may not be his, but we don't doubt the power implied (we're also familiar with Gomes' strength). It never hurts to have a good tale behind a story ballet, and Shakespeare's deeply troubling examination of loyalty and deceit reveals the darkest side of man's nature. James Whiteside made for a believably sinister Iago, slithering and scything his way around the stage's perimeter like an angry shadow. Julie Kent's Desdemona is effectively naive, and Stella Abrera, as Emilia, perfunctorily foreboding. The addition of Bianca (Misty Copeland) and Cassio (Joseph Gorak), who become vehicles for betrayal, flesh out the stage action while clouding the narrative. Still, these two magnetic dancers have some of the best sections of dancing, unchained from the text. The white scarf becomes a searing emblem of love; the more hands that touch it, the more tainted it becomes as a symbol of devotion. Agnes De Mille's Rodeo, on the other hand, begins with its lead cowgirl, Xiomara Reyes, longing for the camaraderie of the posse of cowboys, but being ignored until she accedes to at least some feminine conventions. Xiomara Reyes is retiring this season, but her lead performance makes that hard to believe. She's as sassy and tomboyish as ever, in this, one of her best dramatic vehicles. It highlights a buoyant sense of humor that can be buried in formal ballets, albeit where she excels technically. She will be missed in this role. 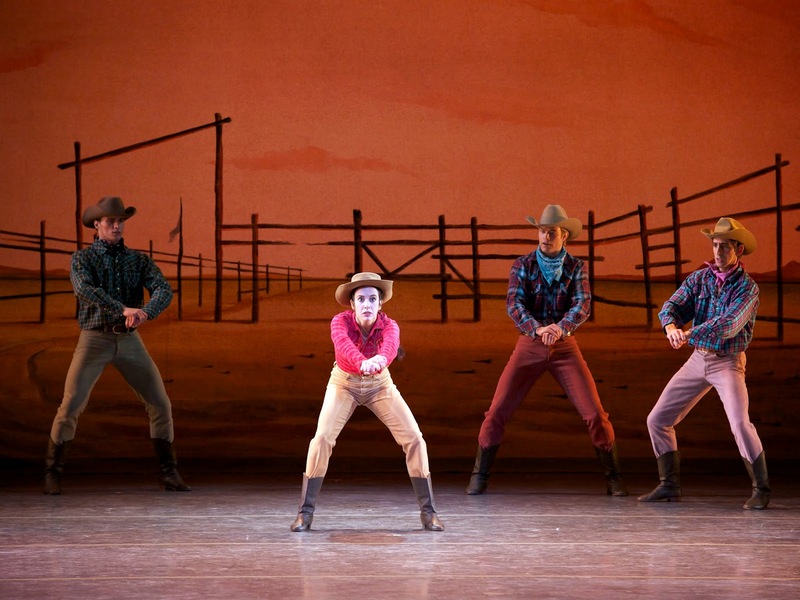 James Whiteside danced the role of the cowboy who moves from buddy to beau, including a lighthearted tap segment. Giselle as well ponders the foibles of the heart, both figuratively and literally. Albrecht falls for, and guilelessly deceives, the frail Giselle, who after death is consigned to join the Wilis (basically, ghosts of unmarried women who taunt men and make them dance to death). Certain ballerinas are born to perform the role of Giselle, and Isabella Boylston is one of them. Her size, her ballon, and flexibility all contribute to a fine characterization. But it is her sublime delicacy that distinguished her rendition in May 23's matinee. When she lifted her leg in an arabesque early in the Act II duet with Alex Hammoudi (Albrecht), the movement was barely perceptible, floating upward steadily, like a feather on the slightest pulse of wind. Battus resembled the beating of a hummingbird's wings. Other dancers—particularly Russians, it seems—milk the drama more, or emphasize athleticism, but Boylston gives a nuanced, quietly magical performance free of histrionics. Hammoudi, a soloist, is maturing into his princely physique. He is on the way to becoming a much needed leading man of a large size. His long legs only accentuate the height of his grand jetes, and he can finesse the details in traveling steps with beats. It can't hurt to play against the company's finest character dancer, Roman Zhurbin, who succeeded in bringing some empathy to the beleaguered second fiddle, Hilarion. This young cast supplied rewards of a different kind than expected from the company's headliners—a variety of stars populating ABT's galaxy. A company is always in transition, but it feels as though ABT is going through more changes than in recent memory, with three principal women retiring (Kent, Herrera, and Reyes), a recuperating David Hallberg out for the season, the oft-cast Polina Semionova injured, and young dancers being groomed for promotions. So while there is Gomes, a fully matured artist in complete command of the repertory, we watch for greatness to emerge from surprising places.